When I first started using a physics library to do collision detection/response I realized that character control wasn't really just handed to you on a plate. I looked at how one would go about adding normal platformer controls using a physics set up and was a bit overwhelmed. So instead of attempt it I took an easy route and made my characters rolling circles. Granted that works for some game types but sometimes you need something a little more interesting. I've been working on adding some platform-y controls to one of my games and figured I'd share what I learned. The following assumes you are creating controls for a 2D game with some physics library (I recommend Box2D or Chipmunk). For most games it is important to be able to detect what portion of your character's body is receiving physics callbacks, for this reason we will need to set up a few shapes to attach to our body. From the picture we can see these four shapes. I have colored the physically interacting shapes as green and the sensor shapes as blue. It is important that the foot sensing shape go beyond the interactive portion of the character so that jump detection can work smoothly. If you'd rather your character not be able to fall over, you can always lock the orientation and the bounding box I create here is no longer needed. The next section will detail how I use this box to help orient my character. 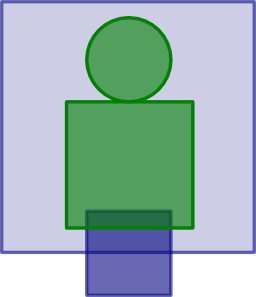 If you can get away with locking your orientation you do not need to worry about re-orienting the character. However, if you do want your character flipping about then please read on! Without any orientation correction, it is inevitable that your controllable character will fall over and potentially start walking with his belly or get stuck forever. Neither of these are all that desirable for most games so we will work on helping the character stand back up. The general idea here is that we know what orientation the body should be in and what orientation the body is in and we want to adjust the orientation to the desired one without breaking the physics simulation. Let's look at some code. Here I wish to orient my character to my dynamic gravity vector, so I compute the angle and normalize it to be between 0 and 2*pi;. I then find the difference angle and normalize that to be between -pi and pi. Now I should have the closest difference angle to my desired orientation (no rotating over 180 degrees). I then apply an acceleration magnitude to get a force out of the difference. Here you may want to note that we want a time-sliced force so you might want to choose an acceleration and divide it by your tick speed. Of course if you don't mind having your acceleration in terms of 1/20th of a second or whatever your update rate is, don't worry about it. We then clamp this to some minimum and maximum force so that the character doesn't try and spin wildly about. Finally we apply the force to our body through the ApplyTorque method. This can be run constantly, or maybe you want to fire it off only when necessary. Either approach is fine, it will just affect how much torque you want to apply. I have a little of both running in my version. As you run around the character will try and orient himself automatically, but if you do fall over the bounding sensor is used to detect such a situation and allow the player to prop themselves up. This is done by checking if the character is not touching the ground (foot sensor) but the bounding sensor is touching something. 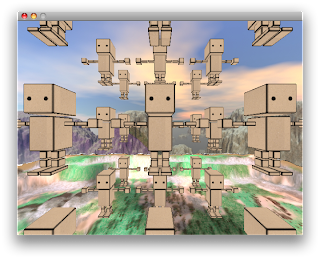 The player can then press jump to apply a small impulse to the character allowing the re-orientation to take control. Walking is fairly simple compared to re-orientation. We simply want to push our character in some direction. Now if we want to only walk while on the ground we need to implement callbacks and keep track of contacts between the character's foot and the ground. I will probably cover this in a later post as doing this using Box2D's current stable interface is a bit involved. For now we can just assume we know when the character is on the ground and move accordingly. Sometimes walking just isn't fast enough and we need to get places faster but we don't have a car/airplane/trained ostrich. So we make due with running. For character control this usually just means a modifier key that signals your control code to up the velocity of the character. Nothing too complicated here. Now what would a platformer be without jumping? That's right, something else. Jumping itself is pretty straight forward, we just need to push the character upward when given the signal. Now what if we want something like Mario where the longer the button is held the higher he jumps? Okay now we're talking! For this, we need to keep track of button states i.e. press/held/release etc.. Let's assume we know these things (I will probably write a post on it later) and head on over to logic town. When the jump button is first pressed we apply a large impulse to the character upward, this acts as our initial thrust and baseline jump. 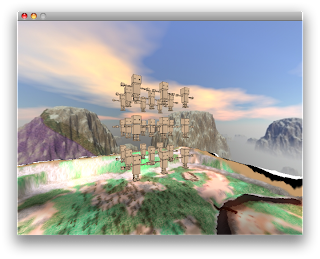 We then set off a timer so we don't just let the player hold down jump and jetpack all over the level. I usually set mine to 1/2 of a second. Now, as long as that timer is not zero (don't forget to decrement it) and the jump key is held down we continually add a smaller thrust to the character. I used a ratio of 1:10 for initial to sustained propulsion which seems to work fine for me. All this is fine and dandy but sometimes we want more, like say the ability to jump further based on current running speed or spinning around in the air or dynamically changing the animation speed with the running speed. Really this is where you have a chance to shine and make your movement stand out. With the basics down you should be able to add a number of things to help deepen your movement. Alright, so maybe I'm not that great at blogging yet, or maybe I haven't felt like I've had anything to say for awhile. At any rate, I've been busy and I need to start updating this thing again. So without any more ado. I've been working on creating a number of extensions and systems that I've found a need for to use with Gosu. It is all C++ since I don't really want to mess with wrapping most of it for Ruby (there are semi-equivalent Ruby solutions available), but in working on this I have certainly accrued quite a bit more experience with C++ and learned a nice set of tricks. The project can be found on Assembla where you will immediately be confronted with my unfinished stub documentation. Until recently, the code base has gone through several dramatic changes which made documenting anything a fairly needless task. However I will discuss a few of the major features here. To start, I've built a simple game state system based on using a stack of states. The topmost state in the stack is sent the normal callbacks of update, render, and button events. In addition to these, there are also initialization, cleanup, pause and resume methods that are called on state transitions. These exist mainly for memory management (something I have not yet fully needed to flesh out). 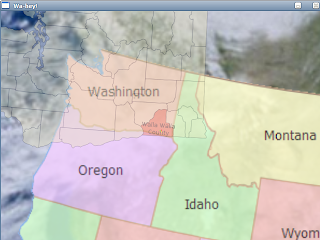 Just today, I added a pluggable factory implementation to aid the dynamic use of states. With this, it is now easy to create a new state that does not have to interfere with the core classes (saving compile times). It is also simple to dynamically create and push new states on at runtime, which eases my need for quick iteration through skipping titles and menus without recompiling (since I don't have hot asset loading yet). Information on this set up can be found on gamedev.net. The only problem I found with that particular example is that static member initialization order is undefined so in order to ensure that things work you must make your maker registry a pointer and create it in the registering function (this is detailed in the forum discussion). Spritesheets are a little more involved, since Gosu doesn't support them directly, but provides an interface to build sheets by returning a STL compliant container holding the Gosu::Image objects. This functionality is contained within my SpriteSheet class which adds support for cycle speed and all the same parameter functionality of Sprite. The parallax rendering is a full parallax implementation, meaning it supports the normal horizontal panning, but also vertical, zoom, and rotation. A demo of this can be viewed on YouTube. Normally, text based configuration in games is done through XML. Personally I find XML to be bloated and goofy looking, despite its power and versatility. Instead, I chose JSON which I find much more readable even though it does not support schemas nor are there many nice libraries that take care of parsing, modification and serialization. The library I am using is TinyJSON, which seems to be disappearing from the Internet. The benefit of this sort of parser is that it is lightweight (aside from requiring Boost::Spirit) and fairly easy to use. It does not support serialization out of the box though it is easily implemented. Because of the complicated data structures used it is quite a pain to modify the data model (the structure does make it rather easy to use normally, just a pain to modify). However, both of these functionalities have been added within the project as well as a cleaner interface to obtain parsed data. Using this, I have established a set of configuration files to direct the flow of the engine as well as tell it what assets to load and how to use them. This ranges from establishing key bindings to window size properties to level environment arrangements. At one point I added configuration support for menus, but for now I prefer to write custom menus in C++. This addition is a popular sort of Gosu Extension, though at the time I started making it there weren't many available (I think everyone started one at the same time). Mine is fairly simple, you create a base object that represents your game window then add objects to that. There is a draggable window component that also supports adding components, but the hierarchy doesn't go much further than that. Alongside this scheme is functionality for what I call pages. A page here is a context for the UI containers that allows the user to use a single container for multiple interface configurations that can be switched between. This is not the most elaborate or feature rich UI system, but it suits me just fine. The final addition I will talk about here is the inclusion of box2D physics. There aren't a great number of C++ 2D physics libraries around, but even if there were box2D is a fantastic one to choose. It doesn't have too many frills which makes it easy to get started using. 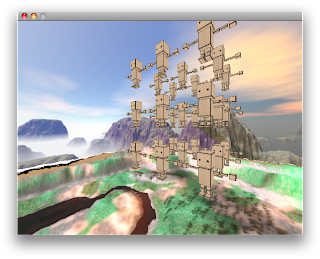 Plus, it is actively developed on by a number of people who know game physics. At this point, my inclusion of it within the engine is pretty minimal. I have a few callback listeners set up to notify objects of collision events, but with the upcoming new version that API will change to simplify my implementation. For the most part I haven't had too much need to wrap any particular functionality or build any crazy contraptions. So I'm going to just let those things build up over time as I need specific things. I will probably be creating a particle emission system at some point that will make use of box2D, but for now I don't really need it. Now, obviously there isn't much point in building all of this if I weren't creating some games. At this moment I'm working on two projects in my spare time. The first is a reincarnation of my "Circle Game" or Hamsterball Galaxy. The point of doing this is that originally I wanted to open up level creation to the users and add several graphical tweaks to the game. These additions were limited to my implementation however since I built my levels as static arrays (holy crap) and didn't spend much time working on the graphics code. This time around, using the engine should make these things much more feasible and hopefully allow me to take the project to a higher level where I'd be more comfortable with attaching a price to it. The other game project is just now coming out of prototype phase and into a formal birth. Sometime last year I toyed around with doing Mario Galaxy style movement in 2D and found a nice starting point to accomplish it using box2D. With that, and more brainstorming I've come to believe that this style of movement would work amazing within a Metroid style run 'n gun - dungeon crawler game. There are still some tweaks that need to be done with movement to make it squeaky clean, but things are still looking promising. This is but one side of my current status, next week-ish I will try to write a post about my graduate work. So I've finished my game for the Ludum Dare contest. Today I spent a few hours fixing my graphics to not be so shoddy. 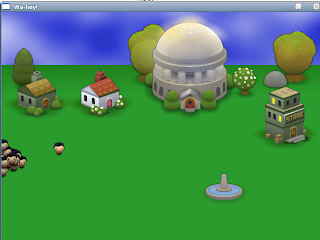 The buildings don't really match up to the scale of the characters, though I'm not really worried about that. As for code changes, I gave both the zombies and player simple momentum for knockback when being hit. For the zombies, this also helped smooth out their movement. I've also put in some simple particle effects on damage. The effect shoots out 10 colored balls which fly out in a random direction and slightly up. They have basic gravity and will bounce when hitting the ground (z=0). For the zombies, I colored them a stale red-near brown. Donuts emit brown, and the player red. This gives a nice effect and really does make the game more interesting. Another small graphical change is that characters turn more red as their health goes down. This is more visually stimulating than modifying the alpha. A larger update added today is a melee attack. You can see from the screenshot that the character is holding a rolling pin. If zombies get too close to the character, he/she can right click the mouse to swing which will hit surrounding zombies and push them back a bit. This is nerfed to reduce players' attempts to rely on it though, by limiting the speed to 1/5 of a second and only hitting ten zombies(this also reduces some sound effects clutter as I didn't build a sound manager of any sort so sounds are played for every action). 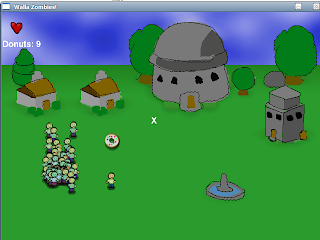 As for optimization, I gave the zombies a timer to stall updating the field which is staggered among all of them. After the initial delay, it will reset to 5 ticks on each count down. This way, with 50 zombies on screen only 10 or so will attempt to update the field at any tick. Adding this did not seem to harm the zombie behavior, and the game no longer crawls after throwing many donuts. The targeting has also been optimized, before they would attempt to update the field for each available target that was close. Now they find the nearest object and update the vector field based on that object only. All in all, I believe the game is a success. It started as a quirky game with some interesting developmental elements, i.e. vector fields for AI movement. Almost forgot links to the game. After seeing some animation of circles spawning with random colors and growing, I started making something similar with Gosu in Ruby. After showing some friends it quickly snowballed into supporting multiple shapes, rotations, random selection and cycling selection. Basically, you need to try it to see what the hell it does.